Stream Communications (Stream), a Machine to Machine (M2M) focused mobile network operator, today announced the capability to deliver enhanced bonded 3G services for broadcasters. For a 3G data connection to be viable for outside broadcast it must meet specialist requirements for high capacity, security and reliability, while addressing the considerable cost implications of transmitting television content. 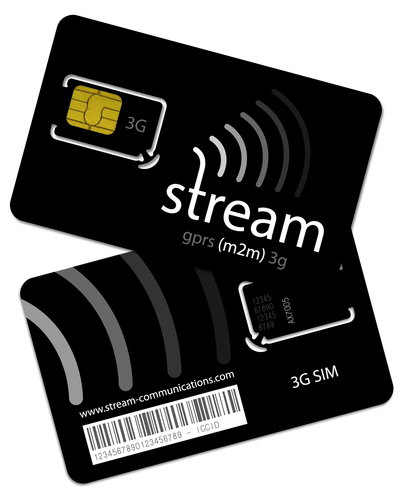 Stream provides broadcasters access to the company’s enhanced mobile network via its M2M SIM cards and a platform which is able to deliver reliable 3G bonded broadcast solutions. By taking a series of Stream SIM cards - offering Network Diversity across carriers in the UK - broadcasters are able to utilise and multiply the bandwidth from each so they can be treated as a single high bandwidth connection capable of delivering speeds of up to 20mb/s over 3G. For a 3G data connection to be viable for outside broadcast it must meet specialist requirements for high capacity, security and reliability, while addressing the considerable cost implications of transmitting television content. With six Stream 3G SIMS bonded and optimised for maximum video quality based, accessible bandwidth can be as high as 30Mbps. That is more than capable of supporting a live 1080HD video stream to deliver a satellite-equivalent broadcast experience. “Outside broadcast depends on the resilience and quality of connection back to the studio. The enhanced 3G network offers a mature, vast, reliable, and stable alternative to satellite,” said Chadwick. With a quick, simple set up and monthly service charge, Stream Communications provides broadcasters with a flexible and resilient alternative to satellite backhaul, with a tariff that is significantly lower when compared to capital expenditure and data transmission costs from hiring or owning a satellite vehicle. As the 3G data connection does not require tethering to a vehicle, with all the additional demands of cabling these bring, it immediately delivers additional advantages in terms of mobility which roving reporters will in particular demand as they are spread across the many and often remote Olympic venues in 2012. This press release was distributed by ResponseSource Press Release Wire on behalf of XL Communications in the following categories: Entertainment & Arts, Computing & Telecoms, for more information visit https://pressreleasewire.responsesource.com/about.